Our first "fun Friday" found us spending our afternoon at Launch trampoline park. 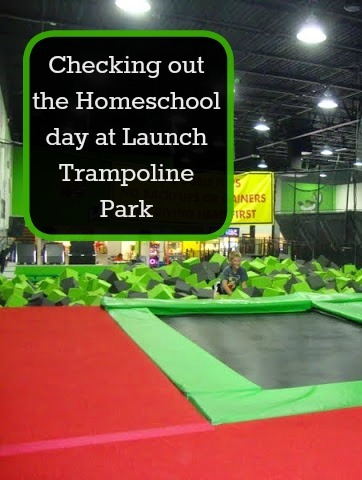 They run a homeschool special-- Friday's from 12:30- 3:00 each child can jump for just $10 and a parent can join in for free. It seems to be a special that is offered at many of the Launch trampoline places. My sister and my nephews were planning to join us and that just made the day even better! Ian spent the morning watching Mom's Night Out. I had rented the movie for myself last night, needing a good laugh and since it was only rated PG the boys could watch it too if they wanted. They thought it was hilarious! I offered to read the first chapter in Harry Potter and The Order of the Phoenix. You could have heard a pin drop they were so quiet. They love this series and listen eagerly to each chapter, interjecting when they remember something from the movie or a previous book that pertains to what we're reading (so see, I know they can sit still and quietly listen when they want to). Alec finished reading the book I am Arachne in the car. Once he finished reading we listened to The Son of Neptune. The boys had such a great time at the trampoline park. When I was telling them about Launch and how much it cost then the older boys helped Evan count by 10's to see how much money we'd be spending. Ian added in the cost of the socks and they came up with a budget for our day. It was great. We had stopped at the gas station before heading out and our gas attendant (with whom we have a great relationship) asked them what they'd be learning at the trampoline park. We arrived right at 12:30 and immediately the boys started comparing Launch to Sky Zone and we found that we preferred Launch. It could have just been that there were more kids there and so they had more fun, it could have been that their cousins were with them, or it might have been that all of the homeschoolers seemed perfectly fine with walking up to one another and striking up conversations, I'm not really sure but I do know they loved it. The boys made some new friends and one of them even came over and introduced himself to me and my sister! We had a great time jumping on the trampolines, playing dodge ball and jumping off the trampolines into the foam block pit. We'll definitely be back for some seriously fun exercise another Friday. lots of new moves all day. Alec and Evan played dodge ball quite a bit today. Once home, Ian went upstairs to watch TV while Alec and Evan spread out the loom bands around the living room and used my computer to teach themselves to make new bracelets. Evan is still working on his Frozen bracelet and finished the inner part while Alec started making a butterfly bracelet. The younger boys cleaned up their stuff and settled down on the couch to watch an episode of Wild Kratts. They re-watched the episode with the cheetah cub and the honey badger. After dinner the boys did their chores and cleaned the kitchen. Ian went outside to ride his bike while the younger two pulled out our dry erase markers and drew/ wrote on our windows. All in all I couldn't complain about our day. They got tons of exercise today, lived science at the trampoline park (and added a bit more science learning in with their TV viewing), listened to stories/ read books, worked on arts and crafts, and even did a bit of math!